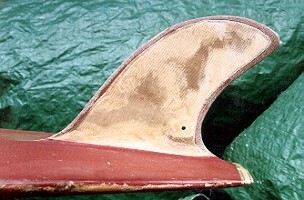 Stringered foam blank with volan glass?, Laminated black and white foam tail block (see image below). 9 1/2" x 11" base. red/black rectangle - on nose. Blue nose, White band at sweet spot, Maroon to tail block - Gel coat. Paul Flack Collection. Photographs January 1997. A longboard specifically designed for maximum noseriding performance, brought to prominence at Tom Morey's Innvitational Noseriding Contest,1965 July 4 Ventura California. US designers went into overdrive in the develpoment of Noserider models: The Eliminator by Greek Surfboards, The Ugly by Con Surfboards, The Penetrator by John Peck/Morey-Pope Surfboards, The Performer by Weber Surfboards, The Stretch by Gordon and Smith Surfboards. A Nose patch became a common decor feature -contest scoring was based on the time a rider could stand on a marked section of the front 25% of the board. Manufacturers often added these, particually to noseriding models, but many riders added the decor post-production. This feature was a excellent marketing tool for Morey-Pope's coloured aerosol wax alternative -Slipcheck andcompetitor Grip-something.? This was the first objective contest - the rider scoring against the clock. A ride of 20 seconds was/is outstanding.